In a recent 60 Minutes interview promoting The Iron Lady, Meryl Streep, when asked how current films and performers stack up to those of years past, claimed that while the classics are the classics, her contemporaries are just plain better actors. Certainly Meryl, like almost everyone else in the film-watching world, forgot about Geraldine Page. Although Page finally won the Academy Award for Best Actress in the year before her death for The Trip to Bountiful, the award smelled of a payoff as she had previously been nominated for Oscars seven times, beginning with 1953’s Hondo. She was at her formidable best in the sixties, handling character-style leads in the adaptations of Summer and Smoke (1961) and Sweet Bird of Youth (1962). She earned Golden Globe nominations for the subject of this essay, Toys in the Attic (which merely got a costume nod from Oscar) and for the following year’s Dear Heart, a seldom seen dramedy opposite Glenn Ford in which she is absolutely spectacular. I’ll give myself credit for one thing as a film watcher: my range is exhaustive. You name it, I’ll happily watch it if I haven’t seen it already. Genre? Who cares — and after having passed the twelve thousand mark, I’ve probably seen it already. Regardless, I’ve seen enough movies, read more than enough books, and surfed enough film writing on the internet and in newspapers to know with a large degree of certainty that Geraldine Page is one of the five greatest actresses in movie history, and undoubtedly the most underappreciated actress of all time by the masses and film buffs alike. Like Streep’s The Iron Lady, Toys in the Attic is by no means a great film, but the 1963 adaptation of Lillian Hellman’s play is fascinating. Page is in her wheelhouse as Carrie Berniers, a New Orleans spinster who shares a house with her older sister Anna (Wendy Hiller, underappreciated as well, and no slouch either!) and dotes on her foolish younger brother, Julian, played by a game but off-cast Dean Martin, in his final dead-straight film role. Julian is a dreamer who bounces from one get rich scheme to another, always in trouble and falling back on the good will of his sisters. At the beginning of the film, he arrives unannounced at the family home, except this time he has money, gifts aplenty, and a brand new wife. His newfound fortune raises the eyebrows of Anna, while the presence his shy wife (Yvette Mimieux) seems to particularly upset Carrie. The film burrows — sometimes unpleasantly — into the issues of the Berniers family’s past and present. Where did Julian’s money come from? Who is his wife? What is the nature of his relationship with each of his sisters? At the center of it all is Page, her performance here is probably too big for the film itself, once again bringing Streep to mind. Page dominates the thing so much that it’s as if the other actors are barely there, and she does it all without giving the impression of chewing the scenery. Her Carrie is someone we all know: the shrill, affected soul (gender doesn’t matter) who tries to hard — the one who pretends to be the smartest person in the room yet suspects deep-down that everyone exchanges secret, knowing glances when she makes an entrance. And yet in spite of this faint self-realization, she blindly plows forward in her pretension and vanity — becoming more and more manic as the scenes unfold and her sense of security is slowly stripped away, like the dark paint flaking off an aging iron porch rail. Hiller accedes to her colleague’s meatier role and gives Page all the space she needs, but Dean Martin doesn’t fare well against her, and Mimieux — terribly miscast in the first place — seems lost. Jason Robards played the part of Julian on Broadway, and it’s interesting to imagine how the dynamic of the film might have changed with him in the male lead. A handsomely aging Gene Tierney appears as well, in a small but critical role, and she’s able to draw on her own sad misfortunes enough to generate adequate pathos to match Page in their brief time together. Actually their exchanges are some of the most gratifying in the film. Hellman seems to wander into Tennessee Williams territory here. This is a story of unfulfilled, incomplete people. Dreamers, fools. The naïve and the cowardly. Beaten, broken, and at times — vicious. The moral center of the movie is Hiller’s Anna, though she seems to lack the courage to speak her mind or act on her suspicions. As the onion of the narrative is peeled back, the relationships of the characters are exposed layer by layer, until tragic consequences are unavoidable. And frankly, for such a verbose and theatrical production, the film’s climax is jarringly brutal. 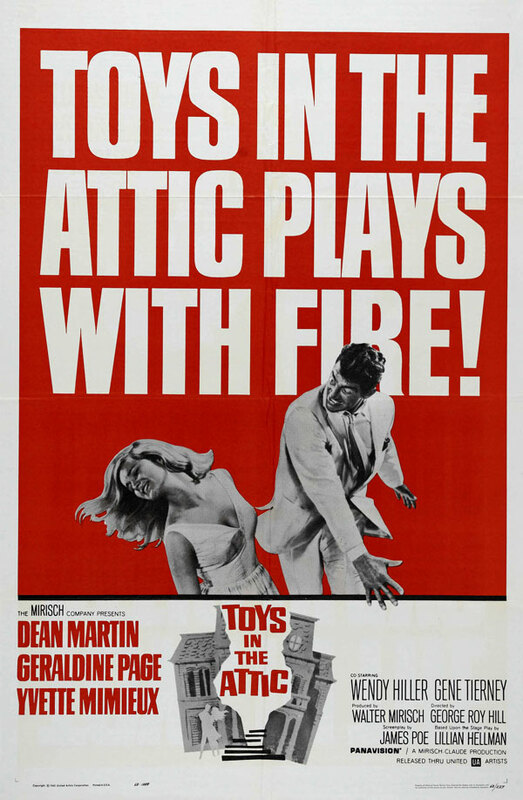 Toys in the Attic is a roughly made film that gets better as it goes: it plods through its first few acts towards an exciting and well-constructed finish. Although its home video status is rather vague, it is worth seeking out. If only for Page. I propose a grade higher than 'C'. Dean Martin plays a weak businessman who needs a shady deal to get ahead. Such a person in real life is a lot like the character portrayed by Martin. Early on, I was locked in to the story with a sense of foreboding; wondering where the tale would end. I say 'B+' because I liked each character, the costumes, the sets, and the gripping storyline. It's a chilling story to me because it's timeless and believable. Hi! I read the comment above and I was wondering if I could find this movie to watch online. Thank you. Actually, Dean Martin did several other straight roles after this-----The Sons of Katie Elder, Rough Night in Jericho, Airport and Mr. Ricco. You are right about that - I stand corrected! Agree with your comment about T. Williams territory. Another site suggests that Vivien Leigh was in the running for a role! Despite some exterior scenes, the production appears stage-bound. And they don't write 'em like that these days! Hey Mark, a couple typos you might wanna fix: Lillian Hellman has two L's, and it's Sweet Bird of Youth; no The. Enjoyed this review and this movie tremendously. Wendy Hiller was particularly good [as she was later in Murder on the Orient Express] and Geraldine Page simply and magically transcends acting here, in the same way Kim Stanley does in Seance on a Wet Afternoon.